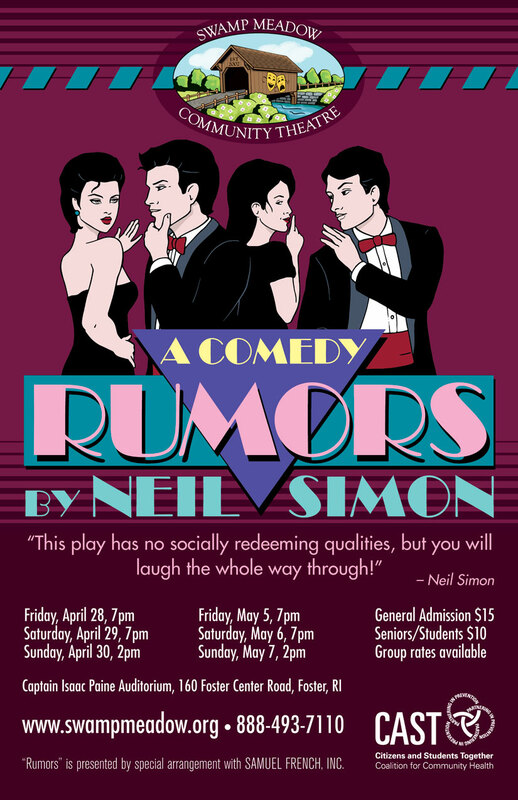 If you love to laugh, then you cannot miss Swamp Meadow’s production of Neil Simon’s Rumors. The highly acclaimed, Tony and Oscar Award winning playwright and screenwright introduced Rumors by saying, “This play has no socially redeeming qualities, but you will laugh the whole way through!” Indeed, I laughed out loud fifteen times just reading the script, and we have laughed uncontrollably throughout rehearsals. Neil Simon’s farce takes a routine 10th anniversary party in Myra and Charley’s high end neighborhood, adds quirky friends, missing persons, indistinct clues, gunshots, and botched cover-ups to make “the mundane – insane!” Get your tickets and unleash your funny bone! The show runs on weekends from April 28 to May 7.